Do You know What The Word HAM Means? The word HAM is often used by many as a shortcut for amateur radio “HAM RADIO”. As a radio operators we call ourselves “HAM” or “HAMS”. The actual meaning of HAM is taken from the three pioneers that helped to make it possible for us all to become “HAMS”. The letter H stands for Hertz (Heinrich Hertz) who helped to develop the theory of electromagnetic waves. The letter A stands for Armstrong (Edwin Howard Armstrong) who was successful in inventing FM (Frequency Modulation). The letter M as you may have guessed already stands for Marconi (Gugliemo Marconi) who was the first to transmit signals across the Atlantic. This time of the year here in the U.K certainly puts any outdoor antenna systems under a lot of strain from windy, wet, winter weather. I decided to do some routine maintenance on my antennas. The first job was carried out on the reasonably recently erected delta loop cut for 20meters. I took the loop down from the horizontal configuration, which also meant that the mast it was supported by which was also the fixing for my vhf vertical also had to come down. This allowed access to both antennas, so I began with the loop by shortening the overall length of the loop, which involved cutting 500mm of each length. The shape being triangular meant removing a total of 1500mm (1.5 meters) of wire and then re measuring each side of the loop to ensure that it was still divided into 3 equal sides. Each side now measuring 6.2 meters in length, giving a total wire length of 18.6 meters. Previously the swr had been at 5.0 on 14.200, the swr with the adjustment was now 2.0 a much more resonant length for this part of the band. The antenna worked well before in the horizontal position however it did bring in a high noise level. So with this in mind and the adjustments of the length completed, I decided to erect it this time as vertically as the nearby tree that was to be used for support would allow me. I was fortunate to be able to configure the loop vertical, with a slight slope towards the bottom. To my amazement once I switched the HF rig on (Yaesu FT-767 GX) the previous noise level was non existent and I was able to hear radio 5 audio with 0 signals coming through from DX stations. I commenced some tests and tuned the loop down to 1.0 swr reading using the auto antenna tuner (ATU) that was onboard the 767. The first station I worked was N2AO followed by WX3B, both were good signals in and out with the loop and when I switched to the vertical hustler the noise level was back and the signals were slightly down. The loop was much better and it was also working very well on 17 meters as well. After a few days in test I am still getting much better results from the loop, however (and thankfully after spending money on the commercial hustler antenna) the vertical occasionally received bigger signal readings from some directions. The loop has definitely been the favourite for all round receive due to the nice sound of audio signals and the distinctive lack of noisy QRN that it doesn’t bring in. I am very happy with the home made loop antennas overall performance. The small homebrew vhf vertical also got some attention when the mast was down, I cleaned the connections as well as the whip. I also checked over and repositioned the 3 ground plane radials that are fixed to the antenna's base. This had also surprised me once I began some tests, as local signals had become slightly stronger by a couple of S-points. I made some contacts on 2meters and managed to get a 5/8 report from G1KDU who is approximately 200 miles south of my QTH. The Band has been in good shape with few good openings quite regularly recently, so a bit of maintenance on the antenna again paid off. I went on to 70cms and managed SSB contacts with a couple of reasonably distant located G-stations, that were operating during a contest. Once again I was quite pleased with the simple antenna's performance. I guess it is quite advantageous to carry out regular maintenance on your antenna to help maintain good performance, especially where they are exposed to the elements like mine. The Bands have been very unpredictable lately with frequent openings around late afternoon on HF. I was lucky enough to tune around 20m whilst driving home from work when I came across 9Y4W(Trinidad & Tobago). He was booming in 5/9, with a big pile up. I gave a couple of calls whilst on the move, and made the contact from the mobile. This was quite surprising in the middle of a pile up with only a simple mobile antenna. Later on during the weekend I worked LW9EOC(Argentina) on 15M using the FT-767, and Hustler Vertical from the QTH. The past few days have been difficult conditions during the evening time due to excessive QRN that I seem to be suffering from every now again. The noise levels have been unusually high, probably down to the extreme wet winter weather we have been getting up here in the North Pennines. It’s been gale force at times with frequent weather warning bulletins given out. The wind has visited my QTH quite a few times recently as well as some snow and more rain. The last couple of days have been dryer with sunshine and temperatures of 6c. Hopefully things will settle down back to zero noise levels again and I will be able to hear the more distant weaker signals hopefully working a few of them. With conditions been up and down and reoccurring high QRN, I decided to operate some PSK31. So I set my self up on 40m again on the FT-767, but this time using the G5RV. There were many stations showing on the waterfall so it wasn’t long before I made some contacts. 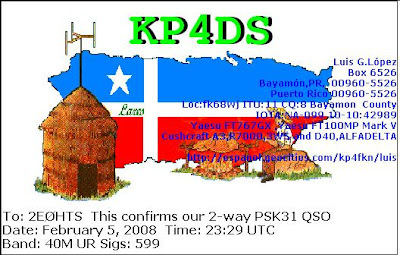 I had some great QSOs into Europe and had the good fortune to work KP4DS(Puerto Rico) on 40M PSK31 running 35 watts. Today I received his eQSL which adds a new confirmed Country to my log. Thanks Luis KP4DS.